The Shang Dynasty: 1500 - 1050 B.C. 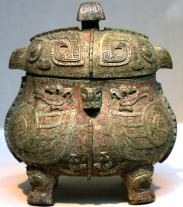 Location: The Shang dynasty was located in northern China, in the fertile land around the Yellow River. The most significant achievement during the Shang Dynasty was the refined writing system. The Shang Dynasty had the first identified written history. The writing system was dated around 1400 B.C. but was well-developed by 1200 B.C. 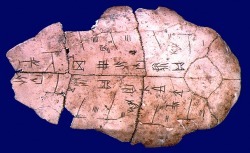 The writings were made on silk, bamboo sticks, stones, bronze items, ox bones and tortoise shells "oracle bones". The writing system recorded information about business activities, warfare, weather, religious activities, and ceremonies. There were over 2000 symbols in the writing system. The writing system was originally made of pictographs. Even though the style of the writing has evolved and become standardized over time, many of its symbols remain basically the same today.